Every year, the team of journalists at The Car Guide declares its Best Buys in a bunch of vehicle categories, including the midsize sedan segment. The latter is popular in Canada, and very popular in the United States, even though like pretty much every type of car, sales are decreasing as consumers are moving over the SUVs. 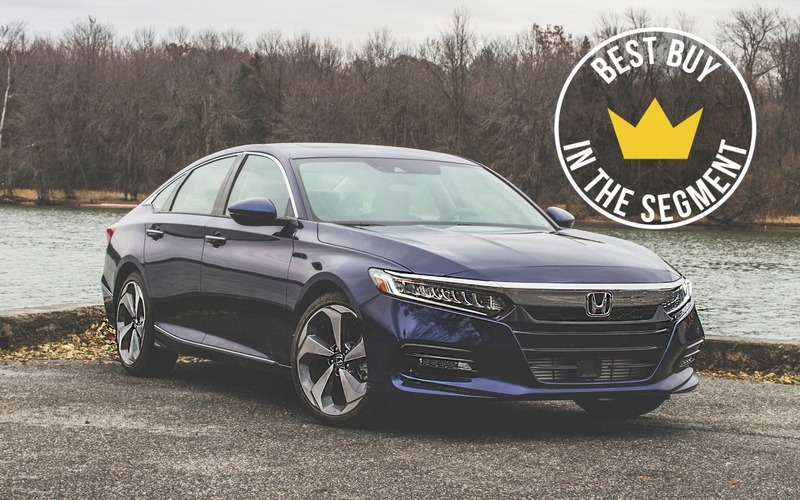 The Honda Accord grabbed the 2019 Best Buy in the midsize sedan category, standing out not only with its powerful, yet fuel-efficient powertrains, but also with its slightly sporty road manners that sacrifices nothing in terms of ride comfort. It’s a highly refined and spacious sedan that also includes a user-friendly infotainment system. And for driving enthusiasts, the Accord still offers a manual transmission, a rarity in today’s cars. The 2019 Honda Accord is equipped as standard with a turbocharged, 1.5-litre four-cylinder engine that develops 192 horsepower, and its combined city/highway fuel economy rating varies from 7.2 to 7.6 L/100 km. A 252-horsepower, turbo 2.0-litre engine brings more performance to the sedan, and a hybrid powertrain with a fuel economy of 5.0 L/100 km is also available. The Accord sedan retails from $28,090 before freight and delivery charges. The Toyota Camry (MSRP from $26,590) ranks second amongst midsize sedans. It distinguishes itself by its excellent ride comfort, its interior space and its extremely fuel-efficient base four-cylinder engine. It’s also available with a powerful V6 engine and a very frugal hybrid powertrain. The Hyundai Sonata (MSRP from $24,899) and the Kia Optima (MSRP from $24,795) share third place with a long list of features for the price, modern designs and the availability of very efficient hybrid and plug-in hybrid powertrains.